2011 Breeders’ Cup Juvenile Analysis: Can Alpha Step Up? The winner of Saturday’s Breeders’ Cup Juvenile will immediately be made the favorite for the 2012 Kentucky Derby. Unbeaten colt Union Rags or Creative Cause can virtually wrap up the 2-year-old title if they come out on top. They both exit grade one wins and have the pedigrees to be classic players next year. Hansen exits back-to-back facile Polytrack wire jobs and is probably the one to catch under Ramon Dominguez. He gets the acid test in his first conventional dirt start. Take Charge Indy has flashed talent on synthetic and is training well at Churchill Downs. He can spice up the exotics. Drill traded grade one decisions with Creative Cause in his last two SoCal starts and should have gotten plenty out of the Norfolk for trainer Bob Baffert. Finally, Alpha looked great in his Saratoga debut and rallied for the place in the G1 Champagne last time. He has plenty of upside and should excel over a route of ground. 1. 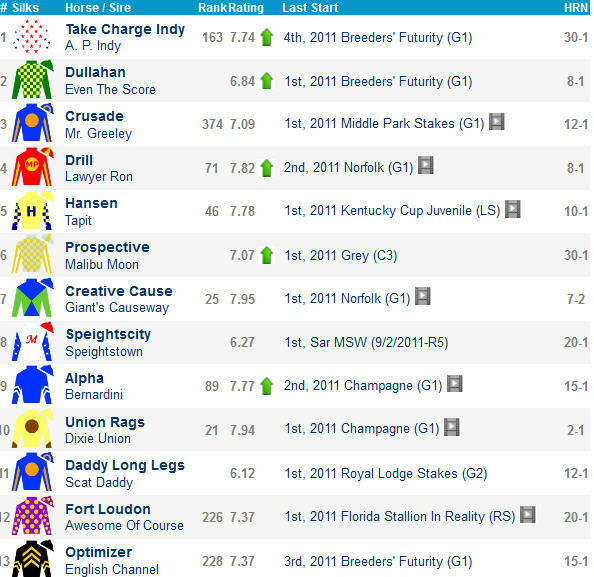 Take Charge Indy (30-1): Bred for dirt and training well under the Twin Spires. 2. Dullahan (8-1): Broke maiden in G1 Breeders’ Futurity. Better on synthetic/turf? 3. Crusade (12-1): British invader tries dirt route for first time. 4. Drill (8-1): G1 Del Mar Futurity winner was clearly second best in Norfolk. 5. Hansen (10-1): Romped in both Turfway synthetic starts. 6. Prospective (30-1): Improving sort exits solid score in G3 Grey. 7. Creative Cause (7-2): Stomped Drill in G1 Norfolk. 8. Speightscity (30-1): Graduated in style at nine furlongs. 9. Alpha (15-1): G1 Champagne runner-up is bred to run all day. 10. Union Rags (2-1): Overcame trouble to remain undefeated in G1 Champagne. 11. Daddy Long Legs (12-1): Captured 2 of 3 overseas turf starts. 12. Fort Loudon (20-1): Rolled through Florida Stallion Series. 13. Optimizer (15-1): Placed in both graded routes on turf/synthetic. Post positions were drawn for the 2011 Breeders’ Cup Juvenile on Monday and hopefully a few of horses entered will make it to the starting gate in the 2012 Kentucky Derby. Below is the advance I wrote on Horse Racing Nation. It’s East vs. West as Champagne hero Union Rags takes on Norfolk winner Creative Cause in Saturday’s Breeders’ Cup Juvenile at Churchill Downs. Morning line favorite Union Rags made it 3-for-3 in his promising career as he overcame trouble to impressively capture the G1 Champagne at Belmont Park. On Saturday, he will try to navigate two turns for the first time from post ten. Creative Cause is 3-for-4 so far with his lone setback a troubled 3rd (place 2nd via DQ) in the G1 Del Mar Futurity. He exits a smart triumph in the G1 Norfolk and is proven over a route of ground. Champagne runner-up Alpha could easily move forward in this spot. Kiaran McLaughlin’s well-bred son of Bernardini romped in his Saratoga debut before rallying for the place behind Union Rags last time. The Godolphin colorbearer should excel around two turns and has plenty of upside with only two races under his belt. Drill has traded decisions with Creative Cause in his last pair. The Bob Baffert runner owns fine tactical speed and is a grade one winner. The mystery horse in this affair is undefeated colt Hanson. Tapit’s juvenile son crushed his rivals in both synthetic starts including the Kentucky Cup Juvenile at Turfway Park last time. He looms a pace factor at the very least but must prove he can handle conventional dirt against a full cast of classy rivals. G1 Breeders’ Futurity 1-3 finishers Dullahan and Optimizer will try dirt after doing the bulk of their damage on turf and/or synthetic. The former is a 1/2 brother to Mine That Bird, and the latter has run well over a route of ground in all three turf/synthetic starts for Wayne Lukas. The BC Juvenile baker’s dozen is completed by Take Charge Indy, Crusade, Prospective, Speightscity, Daddy Long Legs, and Fort Loudon.